Built-in ramps make taking a wheelchair-bound friend or relative to a doctor’s appointment or the mall safe and convenient. Visiting a private home or another location without an ADA-compliant ramp may make it difficult to maneuver a wheelchair into the building over steps or a high door threshold. Unless you have a permanent wheelchair ramp in front of the entrance to your home, getting someone in a wheelchair out of the house and into a vehicle can be a chore. If it’s not practical or financially feasible to construct a permanent wheelchair ramp, a collapsible wheelchair ramp offers a safe, inexpensive solution for navigating your home’s steps or door threshold. Portable wheelchair ramps also make it easier to help temporarily or permanently disabled get into or out of vans and trucks. Portable ramps made of sturdy, slip-proof material, give wheelchair bound people (and their caregivers) more freedom to go where they want when they want. You should consider the following key points to find the best portable wheelchair ramp for your needs. What is a Portable Wheelchair Ramp? A portable or folding wheelchair ramp helps wheel-chair bound people access private locations, such as a friend’s or relative’s home. You (or your friend or relative) can still attend social events and go on outings despite using a wheelchair. Portable ramps, usually made of aluminum with skid-resistant covering for better traction, roll up or consist of sections that can be taken apart and stored between uses. What Should I Look for in a Folding Wheelchair Ramp? Portable wheelchair ramps range from two to eight feet in length. Depending on the ramp you choose, they hold between 200 and 800 pounds. Many portable ramps offer self-adjusting transition plates. The plates allow you to fit the ramp over curbs or stairs any way you see fit. Measure the height of the steps or curbs you’ll need to place the ramp. Also, consider the length of the ramp. Will you need to push the wheelchair up two feet to an entrance, or from a van to the entrance? A six to eight-foot portable ramp provides sturdy access to and from mini-vans. The ramp needs to correspond with the width of your vehicle (at the wheelbase). Because the maximum side door opening for U.S. mini-vans reaches 30″ wide, almost all ramps measure this width. Think about the space you’ll need when you turn the wheelchair around. Check that you have between three and four feet at the entrance and exit parts of your ramp. Make sure the ramp won’t end too close to a wall or other undesirable location. A ramp that goes from your garage to a laundry should give you enough space to maneuver without the washer or dryer getting in the way. To choose the correct ramp length, use six inches of ramp length for every inch of vertical rise. An incline with a ratio of more than 6:1 will make it harder to push up a manual wheelchair and may cause power-operated chairs to stall. Use this calculator to figure out the right ramp length for your needs. Some ramps have a Top Lip Extension (TLE) that connects with the top of the ramp to create a deeper bridge in your vehicle. This bridge allows a smoother transition from the vehicle onto the ramp. You can also use the TLE on door thresholds. 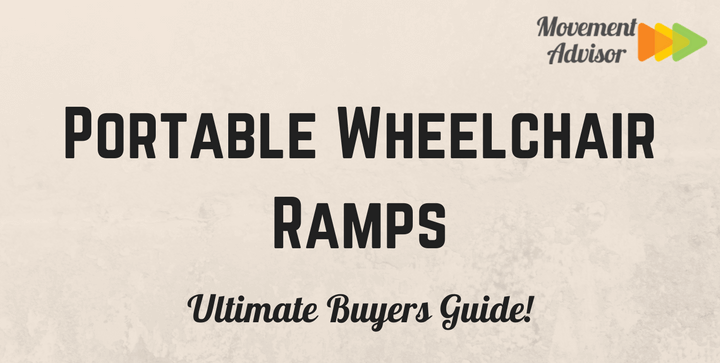 You’ll find that most ramps offer a non-skid surface to make sure the wheelchair stays securely rooted on the ramp. Look for a ramp with safety edges on each side to provide further protection against accidents. Certain ramp manufacturers also offer a solid surface portable ramp with handrails to improve access. This type of ramp is a mid-range option between collapsible and built-in ramps. You can leave these solid, semi-permanent ramps outdoors year-round or store them in a garage. Although some homeowners prefer to build a permanent or removable ramp, not everyone has the mechanical skills to complete such a task. You’ll also need to check with your city or county regarding building codes regarding that apply to the addition of a permanent ramp to your house. Buying a portable wheelchair ramp gives you tested, professional quality construction, along with a manufacturer warranty and customer service. Easy-to-configure, foldable ramps are available online, at some home improvement stores, and medical supply houses. Measuring 3 feet by 30 inches, you can use this foldable ramp to maneuver wheelchairs over high door thresholds, stairs, or in and out of vehicles. Use this ramp with door thresholds that are three inches or higher. The ramp will hit the ground and start rocking if you use it on a low threshold. You can fold this portable single fold ramp in half for easy storage and transport. After folding it, carry it by its handle like a suitcase. The 30” wide ramp works with any wheel configuration. It can hold up to 500 pounds, so you won’t need to worry if you transport an overweight relative or patient. The surface, covered with non-skid resistant tape, has been tested by Underwriters’ Laboratories and listed as safe. (The skid-resistant surface stays safe even when wet.) To further ensure comfort, the ramp offers welded fabrication instead of riveting. A lip on either side of the ramp prevents wheels from dipping over to protect the user. The 30” Prairie View Portable ramp comes with an instructional video and extra security pins. Available in 2' to 6' lengths. By removing two hinge pins, the ramp can easily be separated into two lightweight sections for easier transportation and storage. Made in the USA of lightweight, heavy-duty aluminum with an applied, slip-resistant surface. Durable, ergonomically-designed carrying handle for convenience and comfort. Optional Top Lip Extension (TLE) compatible. One of the best-reviewed portable ramps on Amazon, the four-foot Suitcase Singlefold AS Ramp has an 89% five-star rating. It provides a working, slip-resistant surface to keep the wheelchair gliding safely from point to point. You can be sure the ramp provides the space and protection needed with its self-adjusting transition plates, which automatically adjust to the ground surface. This four-foot ramp is right for curbs and one or two steps. For mini-vans or SUVS, you’ll need the five or six-foot ramp, available from EZ-Access. 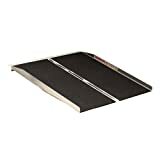 This ramp offers a usable size of four feet, 29.5 inches, enough to accommodate a wheelchair-bound person getting in and out of a house or office building. Take out two hinge pins to divide the single-fold ramp into two sections with ergonomic handles. Each ramp section weighs ten pounds. This ramp doesn’t take up a lot of room when you store it, which is a plus if you share a home or live in a condo. The Suitcase Ramp works best with wheelchairs that have four wheels, but people in three-wheeled chairs may have trouble maneuvering it. The Titan Multifold Wheelchair Mobility Ramp garnered a 5-star rating from 68% of Amazon users. If you need a sturdy ramp that works for companion-assisted wheelchairs and wheelchairs propelled by the patient, the Titan Multifold will work for you. 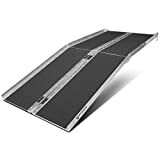 Unlike shorter ramps suitable for only curbs and steps, this 72″ ramp can be used with landings, vans and the back of pick-up trucks. Aluminum with a slip-resistant grip surface, this multifold portable ramp has a 600-pound capacity. It has a 2.5″ angled lip containing holes so you can hold ramps in place. To load and unload wheelchair-bound passengers from your vehicle, you need to attach the lip to the top of the loading area. The Titan ramp has a usable space of 72″ L x 30″ W, with a folding size of 40″ x 15″ x 8″. You can carry the folded ramp with ease by using the soft nylon handle. Some users may find the ramp a bit heavy to carry for long distances since it weighs 40 pounds. Pull out a couple of safety pins to unfold the fully assembled ramp and stow in your garage or other storage space. Use with a wheelchair or scooter only; this ramp isn’t recommended for walking. Weight must be evenly distributed on the ramp, or it will dip in the middle. Finding the best portable wheelchair ramp for your situation can significantly improve the daily life of a disabled or elderly family member. Remember to measure the incline, clearance and consider the proper ramp length needed. Contact the manufacturer’s customer service department or talk to a rep from your medical supply house if you aren’t sure what size ramp you’ll need.